A bust of Guglielmo Marconi was a gift from the Lions Club of Turin to the Lions Club of Sydney to mark the golden jubilee of AWA Ltd, the Marconi Company`s Australian representative. Originally unveiled at AWA in Ashfied in 1964 the bust was transferred to the care of OTC when the site was vacated in 1990 and was located at Ningi near Bribie Island. 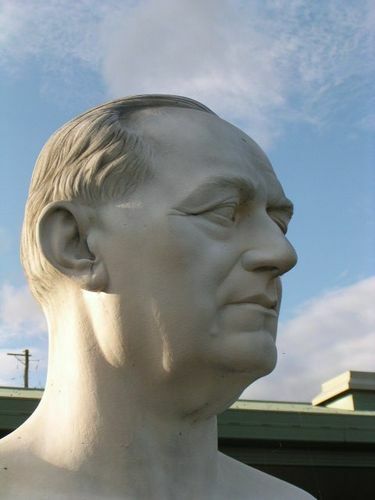 The bust has since been relocated to the Queensland Telecommunications Museum. Guglielmo Marconi, (April 25, 1874 - 1937) was born in Bologna, Italy, the second son of an Italian landowner and an Irish mother. He was the founder of the Marconi corporation and the joint 1909 recipient of the Nobel Prize in physics. Although many scientists and inventors contributed to the invention of wireless telegraphy, including Faraday, Hertz, Tesla, Edison, and others, Marconi`s was the first practical system to achieve widespread use, so he is often credited as the "father of radio". This bust was a gift from the Lions Club of Turin to the Lions Club of Sydney to mark the Golden Jubilee of AWA Limited the Marconi Company`s Australian representative. It was unveiled at AWA`s Ashfield site 14th March 1964. AWA vacated the site in 1990 and the bust was transferred into the care of OTC Limited.